Songkran in Udon Thani, is without question the most eagerly awaited festival of the year by the Thai's, and indeed many visitors too. Songkran officially takes place every year between April 13 - 15, although in some places it can start a day or two early, and finish some days later. Most of Udon Thani residents are happy with three days of water madness though, unless the 13th April falls on a Sunday, then 12th Saturday is likely to be quite lively in places. Songkran is essentially an annual water festival where the locals and any visitors who care to take part, can become big children, and drench every passer by with water. 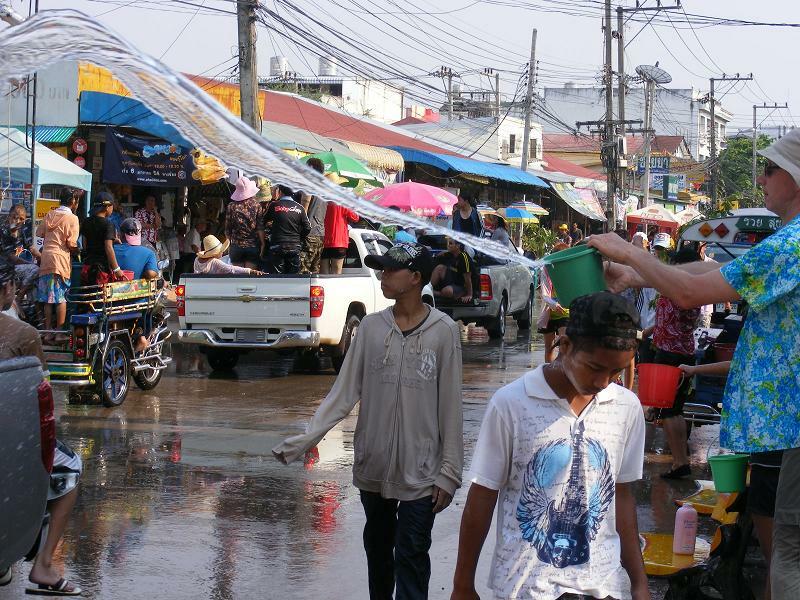 It is a festival, that takes place on the streets of Udon Thani and involves throwing water an anyone and anything within reach! However, it is not customary to throw water at street vendors or the police, but few others can escape the madness, and it is great fun. The day typically starts at about 11.00am, although if you venture out anytime after day light, there is every chance you are going to get a soaking or two just about anywhere you choose to go, with lots of eager small children getting a head start. In Udon Thani it begins to liven up around 1.00pm, once they have all had a chance to wake up and feed themselves. 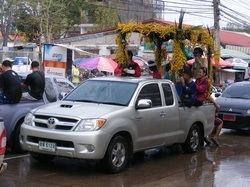 As the day progresses, more and more pick-up trucks carrying lots of water throwing passengers make their way between Nong Sim Park, Nong Prajak Park and UD Town. The two parks, where the reservoirs are located, are used as pit stops where the large water containers on those pick-ups are filled up for the next trip round the city. You will also notice the number of people just walking round the city increases in numbers as the day wears on, then later still, as the sun begins to set, the street dancing becomes more and more evident. This street dancing is largely fuelled by lots of drinks throughout the afternoon, and continues through the evening until most wander off home at between 9.30 - 10.00pm. I can honestly say that I genuinely believe that this type of fun that lasts for a full 3 days or more, back in England, would be nothing short of a disaster, with drunken fights breaking out in many places. That is not to say there are not problems during Songkran in Udon Thani as there are some fights that break out, but these seem to be isolated incidents. As with anywhere in the world, alcohol plays a part in these troubles, but when you consider just how much alcohol is consumed during the festival, the Thai's are remarkable subdued and just want to have the best time possible, without causing grief to others. If you can manage a visit to Udon Thani during the Songkran festival, then I would urge you to get as involved as you can, as the more involved you get, the more you are going to enjoy it, and that is a promise. All the local Thai's will love you for taking part and will make you feel very welcome, and you are likely to get quite a lot of attention, in addition to becoming a prime target for the water to be aimed at. Foreign visitors and ex-pats are not quite a prized target for the water treatment, as there is a good number staying in Udon Thani at any given time, but all foreign visitors and ex-pats are targets, something you will realise as their eyes light up as they approach you, shouts of 'ferang' can be heard, and an evil little smile often appears on the face, before the inevitable soaking arrives. The young kids really do appreciate a water fight with a foreigner, and really get quite enthusiastic about it. 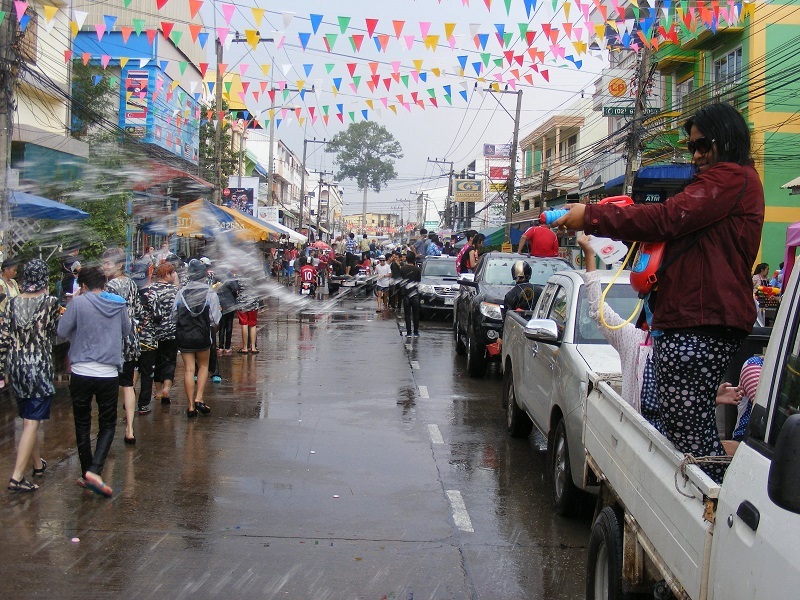 Songkran 2015 will officially start on Monday 13th April, so there is every chance that Udon Thani will experience a five day water throwing party, with children using the Saturday and Sunday as 'practice' days. 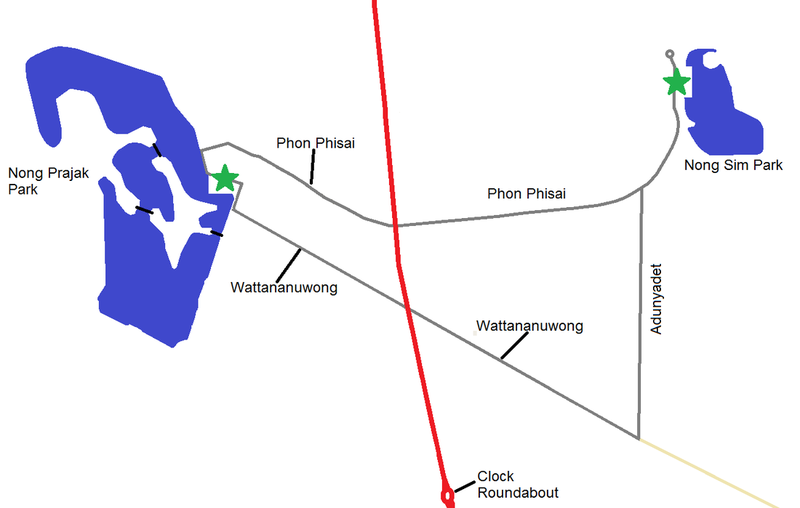 Wherever you go in Udon Thani, during Songkran, you will get wet - it is inevitable, but if you want to get really involved in the thick of the action, there are 3 areas which I would recommend, and these are shown on the maps below. The main water fights take place in a triangle essentially, and the scenes on these roads are quite unbelievable at times if you have never visited during the Songkran Festival period. 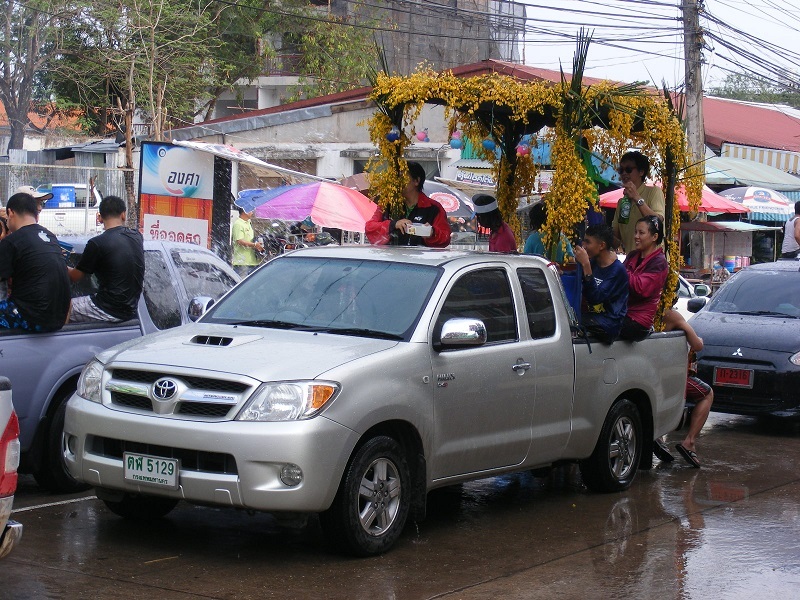 It is not unusual to find many different spelling for the Songkran Festival, as words from Thai in to English really do seem to lose a lot in translation, and much depends on who has heard the word, and how they have interpreted what they have heard. Listed below are just some of the variations I have seen to date, but they are all the same thing.